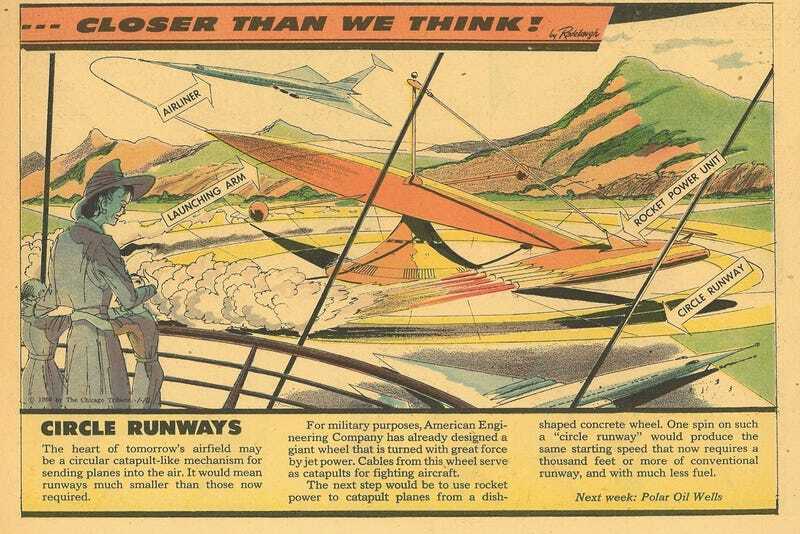 The January 10, 1960 edition of Arthur Radebaugh's Sunday comic "Closer Than We Think" includes a curious invention that was supposed to literally catapult us into the Jet Age: The circular runway. The heart of tomorrow's airfield may be a circular catapult-like mechanism for sending planes into the air. It would mean runways much smaller than those now required. For military purposes, American Engineering Company has already designed a giant wheel that is turned with great force by jet power. Cables from this wheel serve as catapults for fighting aircraft. The next step would be to use rocket power to catapult planes from a dish-shaped concrete wheel. One spin on such a "circle runway" would produce the same starting speed that now requires a thousand feet or more of conventional runway, and with much less fuel. The Navy actually tested a similar circular runway concept in 1965. The big difference between the Navy's tests and the runway envisioned by Radebaugh? The Navy's was much, much larger and didn't have that sci-fi "rocket power unit" to propel the plane. According to the New York Times, the Navy pilots who tested their makeshift runway found that take-off and landing was "surprisingly easy." Landing is accomplished by approaching the runway in a 15 degree bank — that is, the wing facing the center of the circle is lowered 15 degrees from the horizontal. Once touchdown is accomplished, the runway seems to take care of the rest. The plane finds its natural line on the runway, depending on its speed. The idea for the circle runway didn't originate in the 1960s. In fact, the circle runway concept dates back to at least the second decade of the 20th century — when air travel itself was still very much in its infancy. Back in the late 1910s an inventor named Mr. H. T. Hanson developed a scheme that was undoubtedly one of the first modern circular runway proposals. He imagined a entire series of circular runways built over the roofs of many buildings, even in cities like New York. From the June 1919 issue of Popular Science: "He would build the platform in the form of a circular, high-banked track — a track that would be constructed of light but strong iron gratings, so that sun and air would still find their way to the streets below." Below, an illustration from Popular Science of what Hanson's scheme was supposed to look like. The circular runway concept never took off*, of course. Their construction was simply impractical for many different reasons, despite getting a surprising thumbs up from the US military's test pilots in the 1960s. They proved it was possible to build low-tech circular runways. But they never could quite justify their existence.